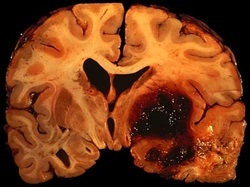 Intracerebral hemorrhage is caused mostly by the rupture of the Charcot- Bouchard microaneurysm that present in the basal ganglia.The hemorrhage typically present at the thalamus and basal ganglia. Charcot- Bourchard microaneurysm is associated with chronic hypertension. Patient who suffer from intracerebal hemorrhage may present with signs and symptoms such as hemiparesis/loss of hemisensation, nausea, headache, vomiting and loss of consciousness. Besides chronic hypertension, other causes of intracerebral hemorrhage includes amyloid angiopathy, bleeding disorders and liver disease. Intracerebral hemorrhage may require decompression therapy. This is performed to relieve the edematous swelling of the brain tissue. The edematous swelling may lead to gliosis due to the present of macrophages and reactive astrocytes.Supportive therapy is also considered. 1.Iragui VJ. “THe Charcot-Bouchard Controversy.” Archives of Neurology 43, no. 3 (March 1, 1986): 290–295. doi:10.1001/archneur.1986.00520030076022. 2.Sessa, Maria. “Intracerebral Hemorrhage and Hypertension.” Neurological Sciences 29, no. 2 (September 1, 2008): 258–259. doi:10.1007/s10072-008-0956-8.